Fall season is all about holiday dresses, sweaters and jackets. For the fashionable mom-to-be who sometimes get overheated, these cooler weather clothing season may spell trouble. The key is to layer, and wear clothing made of breathable fabric. In my opinion, you cannot go wrong with Isabella Oliver. I’ve loved the brand since I was first starting my family. 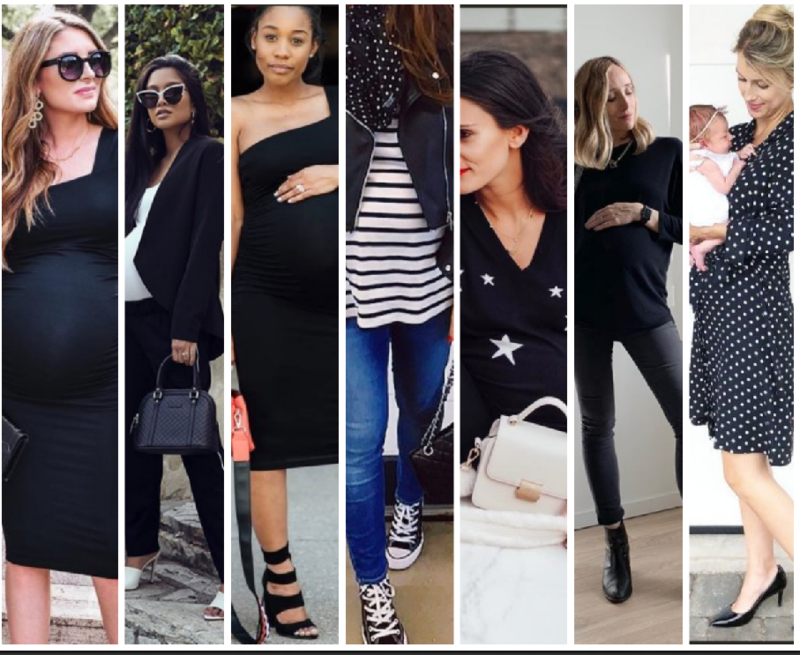 The price point is moderate and the majority of the clothing is made with ruching on the side so you can grow with it and wear the brand all 40 weeks and well into the 4th trimester as you deal with life with a new baby. It is a style that is well known and liked by several of the celebrity moms featured on this blog. Blogger Clarissa Alvarado does HBIC chic excellent. This Isabella Oliver Layering Tank for $37 (down from $74) is long so you can layer it under sweaters and jackets. It comes with an internal shelf bra for extra support and can be worn during pregnant and after. It’s made of soft premium jersey material. You can get the boohoo Maternity Waterfall Belted Jacket for $28. Carissa is wearing Top Shop’s Side Pipe Joggers ($60) which is sold out but can be substituted for Duo Maternity’s Overbelly Straight-Leg Trouser Pants ($23). Not sure what quilted bag she’s carrying but I’d go with Michael Kors Whitney Mini Leather Satchel for $142 and I think Tom Ford shades would work. It’s officially sweater weather so I’m loving Aubrey Ballard in Isabella Oliver Annora Maternity Intarsia Knit sweater. Her Pumas ($50) are red hot too! 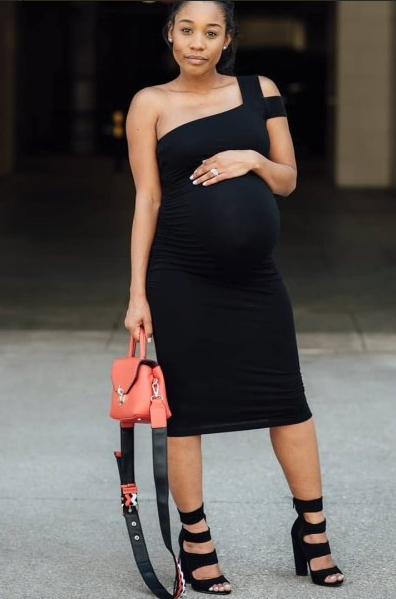 Postpartum moms can do no wrong by sticking with wrap dresses, A-line dresses and dresses with empire waist tops after baby like Vintage and Grace blogger did in this Isabella Oliver Elisha Maternity Dress ($168) that she paired with black pumps. Just because you’re preggers doesn’t mean you cannot rock skinny jeans either. Several brands sell the style to accommodate expecting women like Good American’s Honeymoon low rise jeans ($149) or Asos’s brand for much less at $23. 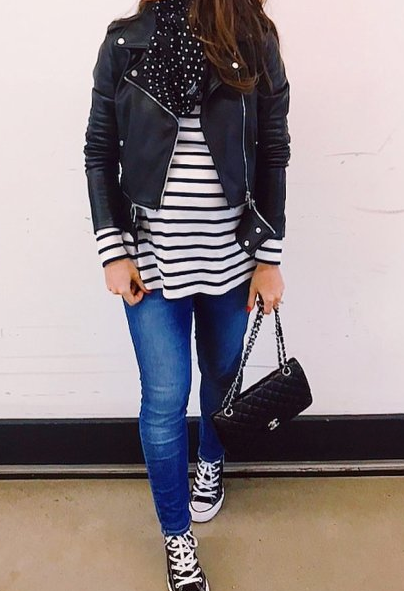 I love how expecting Australian blogger Sharday Engel looks in this post from her Instagram.